At the monthly Illout, people dance to music that's not overplayed. They can hear local, well-loved DJs. It's a chill, Fourth Avenue vibe, attracting pro and amateur dancers and holding space for those who are brave enough to step inside the dance circle, or cypher, and do their thing. 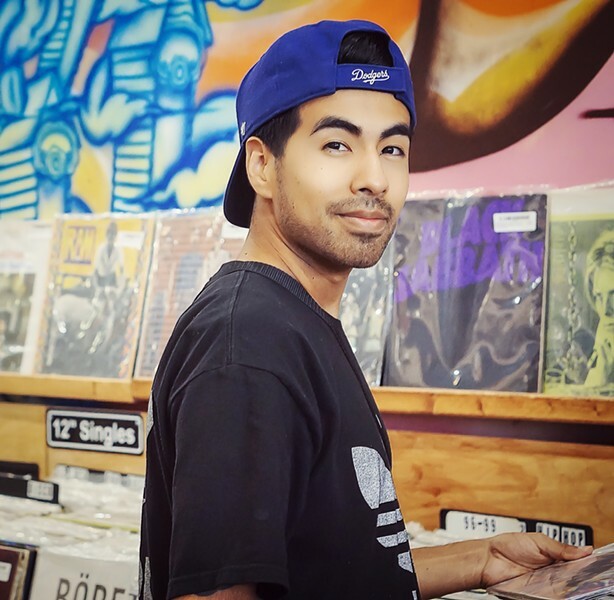 DJ and Illout cofounder Tim Madril (aka Hashke) creates a musical mix that inspires him. At March's dance party, the lights were low and he went on a '90s kick, playing A Tribe Called Quest, Cypress Hill and even a taste of "The Humpty Dance", Digital Underground's iconic 1990 hit. In February, Madril stuck with a romantic, Valentine's-inspired playlist. And in January, the musical theme was one of festive new beginnings. "It's about dancing," Madril says. "It's for dancers who don't want to go to the club and hear Top 40." Like Madril, Illout's other cofounder, Spencer Brummer, aka DJ Alias, is excited to bring music to Fourth Avenue that's not typically heard in a club setting. "It may not be songs you've heard before, but if it's got a groove, it gets played," he says. "We're also trying to provide something that's got a little bit more interesting musical content." Brummer had the idea for a dancers' monthly after DJing at clubs that break up dance cyphers—that organic circle that forms where people take turns dancing in the middle. He says clubs and DJs break it up because it's intimidating for the average dancer. Brummer wants Illout to be the place where the novice dance-lover can try out the cypher right alongside the professional dancer who's just having fun. "The energy at those things is so hype, and the dancers really enjoy it," he says. "You don't have to go crazy and display anything but just kinda share in that energy that's the cypher. Go out there, do a little move and come back out." Madril and Brummer met in 2012, when Brummer was running the youth-focused nonprofit RebelArte Collective out of Skrappys (191 Toole now). Madril was 18 and break-dancing there when he started Brummer's DJ classes. "I was super into it," Madril says. "I was usually the first one there and the last one to leave. I would help him pack up. I was eager to learn." Of all the kids attending those classes, Madril stood out. "He had a very clear way that he saw the world," Brummer remembers. Madril grew up in foster care and group homes. Finding dance, DJing and the hip-hop culture changed his world. He credits hip-hop with setting him on the path to graduating high school, then earning an associate degree and working at Pima Community College. "When I started to dance, started learning to DJ, that gave me the belief that I can do something," Madril says. "In most cases, for people who contribute to the culture, hip-hop was very empowering for them." He says a lot of the kids he grew up with have ended up incarcerated and in gangs. "All that energy that they've put into representing their colors, I've put on the floor or into music," he says. "If I didn't start learning about hip-hop, I really don't know what I would be doing today." What he found in the hip-hop scene was a family. People who really knew each other, who ate together, laughed together, danced and made music together. "I wasn't out trying to look for a personality," he says. "Hip-hop is just something that I felt like myself doing." Madril would like to see the hip-hop scene continue moving toward youth empowerment and a call to social justice. He sees Brummer as a father figure, having worked with him over the last five years. Brummer started DJing at home in '95, when he was in his early 20s, but just for himself. It wasn't until years later, as a husband and a father, that he saw the need to overcome his stage fright and share his skill with the community. In 2009, while his wife was a teacher in Tucson High's Mexican-American Studies program, which the state shut down in 2010, she asked Brummer to DJ at the school's Unity Festival. Although he was nervous about being in the spotlight, he came out to support the program that benefited so many Mexican-American youth. Shortly after, he started hosting and DJing monthly park jams around town, with the intent to bring music and the arts to youth and the community. "The idea behind that was to make noise in this neighborhood and have people from the neighborhood come in," he says. "That's how we were going to reach out to the young people." With his friend Usiel Barrios and six like-minded young adults, he started RebelArte and Elementary Hip-Hop Skhool. They went to schools and gave presentations about the history and culture of hip-hop. Eventually, they took over Skrappys, where he first met Madril. The two would sit on the front stoop after DJ class and passionately talk hip-hop. It is a culture that deeply resonates with them both. Now Madril's about to move to Phoenix, where he's been accepted into Arizona State University's School of Film, Dance and Theatre. Everyone has a story, he says. And he wants to give voice to those tales. He has one documentary already in the works—the development of hip-hop in the Southwest. The film examines how hip-hop has affected people's lives and documents its lineage and tradition. This Friday Madril and Brummer will be celebrating their own tradition at Illout's first anniversary party. "It's that energy of that cypher—that circle of dancers," Brummer says. "It's kind of what you used to see on Soul Train. You'd have that line of dancers that would come through, and everybody would have their little chance to shine in the center. It's the same type of energy."